To calm things down for me I would like to share some new hair care products from L’Oreal Paris that I received from Influenster. L’Oreal has a new hair care line out for battling dryness without the heavy weighed down look and is easily accessible to anyone. Extraordinary Oil consist of a nourishing shampoo and conditioner, a lustrous oil serum, and transforming oil-in-cream, all packed with Argan, Chamomile, Coconut, Amla, Soja, and Sunflower oils. The scent is light and very non offensive. I had the pleasure of trying out the shampoo, conditioner, and serum. Overall the products were okay. Nothing life changing for me but everyone’s hair needs are different. I will say my hair wasn’t weighed down but I didn’t receive any extra volume which is what my lifeless hair really needs. The shampoo had a mild lather and is not sulfate free so both of those were a turn off for me. You certainly want to be cautions with the roots, the conditioner I avoid the root are at all costs, because you will be left with an oily residue. I will note that dry scalp was not an issue which was great, my scalp can be very picky! Now the serum I actually really enjoyed! A little goes a long way and did give my ends much needed moisture. Again the smell was pleasant and not overwhelming. I used this products on wet hair before blow drying or dry when pulling back to tame flyaways. 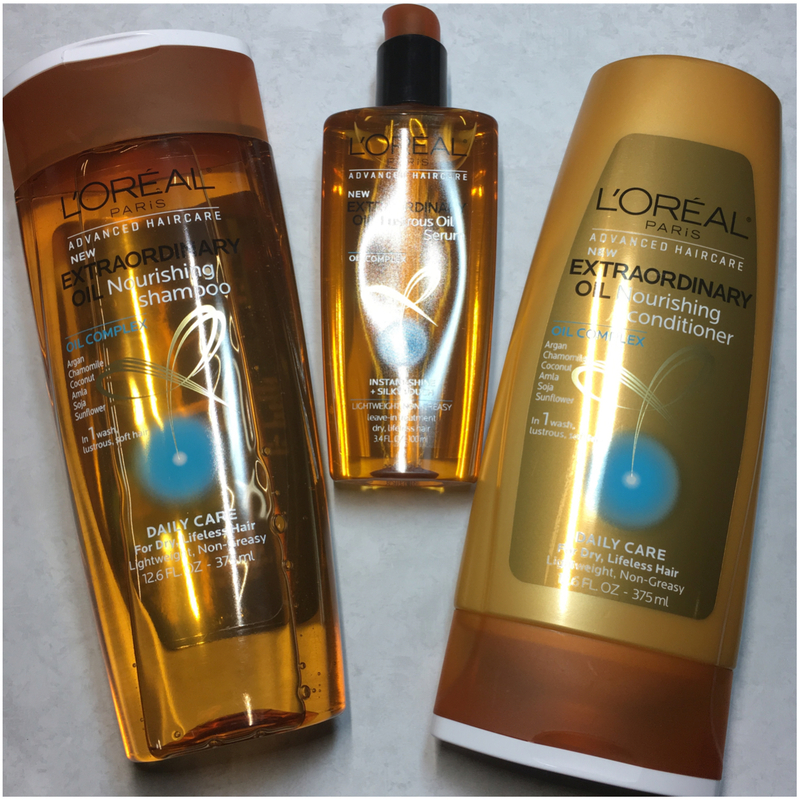 Have you tried out L’Oreal’s new Extraordinary Oil products yet? How did they work for you? Overall, I was pretty meh. I went about a 1/4 away through the bottle before switching back to my regular product. I will be saving this for more summer use, like after a long day of swimming or being in the sun. If you like trying out new products at little to no cost, you really need to check out Influenster. I have found some gem products thanks to them! Thank you so much for stopping by today and I will see you all again tomorrow! These products were provided for free from Influenster but that does not influence my opinions.